Orafti® Oligofructose from natural sources. The functional fibre Orafti® Oligofructose is an inulin-type fructan. Oligofructose is derived from Inulin through partial enzymatic hydrolysis. This conversion is a process that occurs naturally within the chicory root towards the end of the harvest. Orafti® Oligofructose can therefore be said to be of 100% vegetable origin. After enzymatic hydrolysis, purification is continued in order to meet even the highest quality requirements, including those for infant nutrition. 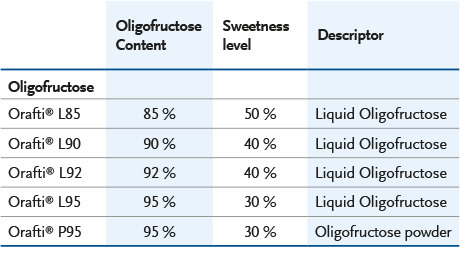 With a sweetness profile of minimally 30% that of sucrose, the benefits of Orafti® Oligofructose reach beyond the nutritional benefits of fibre. Its mildly sweet taste and sugar-like technical properties makes it the perfect natural sugar reducer. Moreover it also allows for calorie reduction and a higher fibre content. 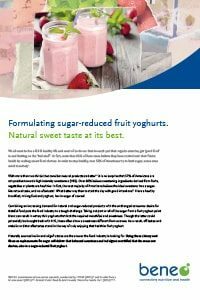 By imparting a delicate natural sweetness, Orafti® Oligofructose is often combined with high intensity sweeteners to create a more balanced and sugar-like palate without any off-taste. Orafti® Oligofructose is the best soluble dietary fibre – even better than sucrose! This facilitates easy processing without the necessity of having to implement any changes to the production process. Typical examples are cereal binding syrups and dairy fruit preparations. Orafti® Oligofructose is a shorter chain inulin that is available in five different varieties with different fibre content and sweetness levels. It is particularly useful and often applied when high solubility and a natural sweetness profile are needed. Get to know Oligofructose better.